As I sat down to write this week's look back at the ARIA chart from 1989, I realised that all seven songs to feature in this post are by groups of one sort or another. It made me think about the types of artists on the top 50 that year - was I imagining it or were there more groups on the chart in the '80s than today? A quick look at today's singles chart shows 14 songs by duos or groups in the top 50 (three by 5 Seconds Of Summer). What about on the top 50 from this week in 1989? No less than 21 entries were by groups. So I wasn't just imagining it. Of the seven groups we'll discuss, I liked four and hated three - in that order. Groups also held down the top two positions on the top 50 this week in 1989 - Roxette spent a fifth week at number 1 with "The Look", while New Kids On The Block closed in with "You Got It (The Right Stuff)" moving into the runners-up position. After two serious - and kind of dreary - singles, Simple Minds chose a piece of stadium rock for the third release from Street Fighting Years. Given its peak position and the fact that the Scottish band had moved away from the sound I'd enjoyed earlier in the decade, I didn't pay any attention to "Kick It In" at the time - and listening to it now, it's still not a patch on earlier tracks like "Sanctify Yourself", "Alive And Kicking" and, of course, "Don't You (Forget About Me)". But, it's better than "Belfast Child". With the more politically correct name of his backing band (formerly The Coloured Girls) now also used in Australia, Paul Kelly surprisingly missed the top 50 with this first taste of his So Much Water So Close To Home album. It was especially unusual since, although Paul wasn't necessarily a singles act, the lead singles of his previous two albums had both managed a top 15 placement - and "Sweet Guy" was almost as good as "Before Too Long" and "To Her Door". As it turned out, So Much Water... became Paul's highest charting album up until that point - and the first to crack the top 10. Originally released in 1983, when it peaked at number 6 in Australia, "Send Me An Angel" is one of those songs that has been resurrected time and time again for one reason or another. In 1989, the reason was to promote a greatest hits album that was compiled despite the fact Real Life had only released two-and-a-half studio albums. A new video was filmed for Australia (which you can watch below), while in the States, a version of the original clip with departed band member Richard Zatorski edited out was used. Here, "Send Me An Angel '89" holds the dubious honour of spending three weeks at number 51, but in America, the remix actually improved slightly on the performance of the original, peaking three places higher at number 26. Dead Or Alive really weren't having much luck at this point of their career, but their pitiful Australian chart positions were actually higher than back home in the UK, where "Come Home With Me Baby" became their fourth single in a row to peak outside the top 60. I was still a fan of the group and actually thought this single was their best since mega-hit "You Spin Me Round (Like A Record)", but it would be the final time we'd see them on the ARIA top 50 with a new track. Onto the bands I wasn't a fan of... This lot had been around since the mid-'70s and landing Billboard Hot 100 hits since 1980, but this MOR rock ballad was their first single to chart in Australia. "Second Chance" was also their biggest US single - their only top 10 entry - and only ended up being recorded after original lead singer Don Barnes left the group, since he'd turned his nose up at an early version of the song years before. Since Don rejoined the group in the early '90s and 38 Special haven't scored any hits since but are still around today, I wonder how he feels about having to sing it now. Here's another relic from the '70s, but in this case, it was a band that'd charted in Australia before - although classics like "Listen To The Music" (number 50) and "Long Train Runnin'" (number 58) failed to match their US success here. The Doobie Brothers' two American number 1s, "Black Water" (number 22) and "What A Fool Believes" (number 12), did perform better in Australia and so there would have been a number of fans eagerly awaiting the band's first studio album since 1980's One Step Closer and this lead single. Clearly that number wasn't very high since both "The Doctor" (which to my ears sounded quite dated even at the time) and Cycles only just dented the ARIA top 50. He'd started off telling us he "Don't Need Love", but things had changed by the time this fourth single came around. Something else that was different with "Lookin' For Love" was that it became the band's first single to miss the top 10 - and it did so by some considerable margin. Still, Johnny and co. did have a hit album on their hands, so it was only to be expected that their singles would run out of steam. That didn't stop the record company releasing a fifth single from Johnny Diesel & The Injectors - but the band's cover of blues standard "Since I Fell For You" didn't even make the top 50 when it was released later in the year. Next week: 1989's most frequently used riff shows up in yet another new entry, while 1988's hottest teen sensations return (down a member). Before that, I'll conclude my countdown of my top 100 from 2006 - I'm halfway through, but you can catch up here and here. I don't follow the charts now, so hadn't really noticed the absence of groups, other than the lack of groups who still play their instruments... or virtually anyone whose song doesn't sound like it wasn't completely made in a computer, but then I'm getting 'old'. 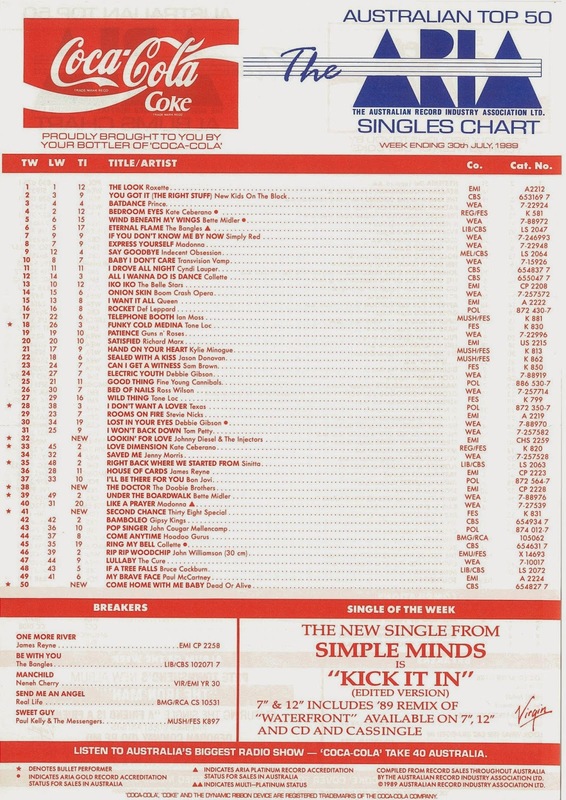 Simple Minds' 'Kick It In' didn't dent the AMR top 100, so it's interesting to see its ARIA peak here... well, -ish, as I don't really know the song. I first heard it on a VHS tape I transferred to DVD a few months back. The 'kick it out, kick it in' line reminds me of something else, but I can't put my finger on it. Oh that's it, Boom Crash Opera's 'Onion Skin'! I liked 'This Is Your Land' best from their 1989 album's singles. Obtaining another outside-the-top-50 chart position from Countdown Revolution, Bangles' 'Be With You' was #54 this week in 1989. The image Real Life had by 1989, and displayed in this video, looks more like they were a pub rock band than a synth-pop act (except for the singer) - i.e. the long hair, and the mullet on the bass player. I wonder what the impetus was for the new version, other than their lack of recent chart success. It seems bizarre that Dead or Alive had more success in pub & classic-rock loving 80's Australia than in their homeland, post 1986. I didn't notice until the mid 00's that one of the dancers was the same guy who appeared in Sonia's 'You'll Never Stop Me Loving You' video. I didn't mind the 38 Special track, but it's one of those 'hits' that have long since virtually disappeared off the face of the earth. Local radio seemed to love it at the time, but I haven't heard it since on any 'golden oldies' stations. I hadn't realised before that 'Listen To the Music' only peaked at #50 here. Same with 'Long Train Running's low Oz chart peak. Quite bizarre as those 2 songs were well-known enough for me to know them in the 80's, even though I didn't know who sang them at the time. I guess it reflects that radio was still playing that kind of stuff, more than a decade later. This was another week that the timer on my VCR failed, so I missed positions 41-50 until looking up the chart on the australiancharts.com site. It seems I didn't miss much. Ha ha, didn't see this before my message. Another thing I just noticed on the chart - the Real Life catalogue no. has CS (cassingle?) before its number, unlike the other BMG/RCA single listed on the chart. Could this have been the first cassingle-only release to (almost) make the top 50? I remember seeing it on that format in the shops, but didn't usually check out the vinyl (or CD) singles sections then. It was definitely released on 7" vinyl - a friend of mine bought it. Tina Turner also did the same with her Best Of in 1991, covering 'Nutbush City Limits'. I have to say I didn't take to the original or this cover. 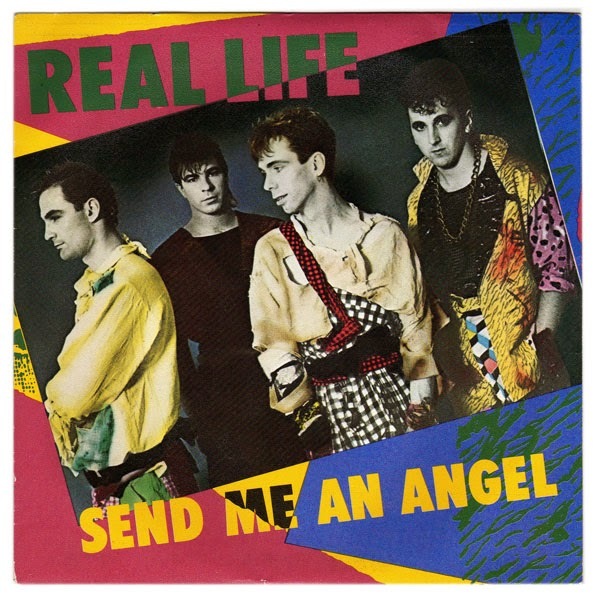 Interesting that Real Life used the same '83 video with the '89 recording, I guess for nostalgia and chances of it doing well in the US, which it did. Funny, for a while there, I always thought the '89 video was the original video. Then someone picked me up on it and of course watching Countdown repeats on rage. I had no idea JD & The Injectors released a 5th single from their debut! Did it ever get a plug on the Aria sheets? By this time, the album was the one to purchase and not any further singles. Always makes you think how some singles (like the 4th or 5th) would perform on the charts if people weren't buying the album. Off the track a bit, I remember a girl at high school used to sing to 'Cry In Shame' with her lyrics....'Picking up the Pizza's up off the floor' LoL. Looking at the chart above, it's funny how few singles have achieved gold and platinum status compared to today's charts. I guess one reason is it's easier to get a gold or platinum record today as the accreditation sales hasn't changes for about 25+ years. I do remember the early 80's it was something like 25,000 for a gold record and 50,000 for a platinum record. Also today, singles sell way better than albums. The albums chart today is pretty dismal. I think the only artist that lifts them out of a lul is when Pink releases a new album. I guess with iTunes as well, people buy singles than albums. Re Dead or Alive, I loved them in '87 and bought 'Mad, Bad & Dangerous To Know' on the back of 'Something In My House' and I really liked 'Brand New Lover' and the 3rd single 'Hooked On Love'. Although, you can keep 'Save You All My Kisses'! I didn't get into music til late '86, so didn't know anything about their previous chart history ie 'You Spin Me Round...' or the band. When I bought the album on cassette and got home and showed by family, my bro and sis just laughed and started singing that song. Not the reception I expected when I thought I picked up the best album at that time. LoL. The 5th Johnny Diesel single, 'Since I Fell For You', peaked at #79 on the ARIA chart in November 1989. I found this info from the Chartifacts column on a 1990 edition of the ARIA report that someone kindly typed up (my local state library only has one pre-Jan '94 edition of the report, from '92). Given its low peak, I'm guessing it doesn't appear as a Breaker later on, but at least one lower-charting single (Yazz's 'Fine Time', peaking at #86) has. Somehow I missed Dead or Alive's 'Brand New Lover' at the time... until someone sent me the 7" video on a DVD in 2011 (I'd skimmed through the 12" video on their 'Evolution' DVD previously, but it didn't register with me). I think it's one of their best singles. But then 'You Spin Me...' was the only track of theirs I knew before I started following the charts in '88. Oh, just found another outside-the-top-50 position from this week in my 1989 chart book, taken from Countdown Revolution when it was a chartbuster. James Reyne's 'One More River' was #51. Another one from Countdown Revolution (sorry, keep adding these as I find them... I'm working on compiling a proper list) - Johnny Diesel & The Injectors' 'Looking For Love' was #68 last week.